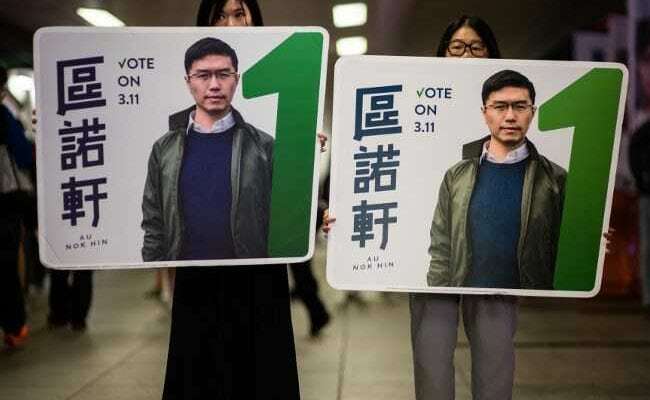 Hong Kong: Hong Kong's pro-democracy camp are trying to claw back lost seats in controversial by-elections held Sunday that have exposed the heart of the city's political divide. The vote comes as China takes a tough line against any challenges to its sovereignty, with high-profile young candidate Agnes Chow barred from standing because her party promotes self-determination for the semi-autonomous city. The atmosphere was tense early Sunday when a small group of people heckled Chow as well as leading pro-democracy activists Joshua Wong and Nathan Law near a polling station, according to an AFP reporter at the scene. One of the men barged into Wong, who was one of the student leaders during mass demonstrations in 2014 calling for a greater democratic freedoms. "When there is a restriction on freedom of speech and we face more suppression on civil disobedience and protest in the streets, it proves that it's more necessary for us to vote," Wong told reporters. Beijing has become increasingly incensed at the emergence of activists advocating independence and sees calls for self-determination as part of a dangerous splittist push. "The election is not just about selecting me as a candidate, it is also about voting for justice," said Au Nok-hin, who stepped in to contest the Hong Kong Island seat after Agnes Chow was disallowed. Many of the first people to cast ballots at a polling station AFP visited early Sunday were more elderly and supportive of the city's pro-Beijing establishment. Others said China needed to recognise people were angry about inequality. Pro-independence lawmakers had inserted expletives and waved "Hong Kong is not China" banners during their swearing in. Others added phrases supporting the democracy movement. The pro-democracy camp has come up against increasing pressure since the failure of the Umbrella Movement to win political reform, with some leading activists jailed on protest-related charges. "It would only add to the disappointment and the loss of faith," he told AFP. But Sing added that even an across-the-board win would be countered by a system fundamentally weighted towards Beijing. Nevertheless, veteran democrats are urging residents to go out and vote. "It is not just a by-election," said pro-democracy lawmaker Claudia Mo. "It's a fight between good and evil."